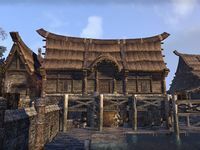 The Frostheart House is a house in western Riften. It is a one-room Nord-style building located above the Lakeside Experiments shop. A cooking fire is situated right across from the entrance. A food pot can be found near it. The area on the right-hand side is furnished with a table, a wine rack, and a desk. Harnald can be encountered in this part of the house. He will open a portal for you so that you can help his sisters, Amitra‎, Mareki, and Theofa, to deal with the Worm Cult. A book, Rilaso's Guide to Tamriel, lies on the table near him. The left-hand side of the house is occupied by a bed, a wardrobe, and a nightstand. Branir Frostheart can be encountered here. All storage containers in the house are owned.